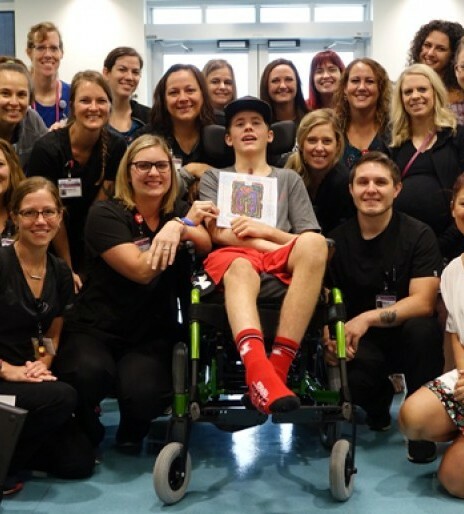 With a special handshake, Hunter Jacobson’s team congratulates the 15-year-old for his determination, positivity and persistence through nearly seven months of rehabilitation at Madonna’s Omaha Campus. “He’s very outgoing, adventurous, fun-loving child. Daring. Very athletic,” said April Jacobson, Hunter's mom. “Wasn’t scare of anything. Hunting, motorcycling, sports,” said Hunter's dad, Bob Jacobson. In early December Hunter was practicing on his bike for an upcoming motocross race near his home in Sandpoint, Idaho, when he was critically injured. Breaking his spleen, 11 ribs and enduring severe brain trauma. “Things were touch and go for the first week,” said Bob. Transferred to Providence Sacred Heart Children’s Hospital in Spokane, Washington, once medically stable, Hunter’s parents say the next step was finding a pediatric rehabilitation hospital. “His father found Madonna on the internet and it was between and he traveled here and he traveled to Arizona to see physical rehab facility there. He traveled to both,” said April. “Once I got here, I knew this was it. I knew this would be the perfect spot for Hunter. It was just the feeling and the area where hunter is set up real well. Clean ... And the whole place stays really clean. That was huge. The therapy room, the therapists, it was just everyone is here to help,” said Bob. Hunter arrived to Madonna in mid-February on day 78 which also happens to be his racing number. “When he first came here the only thing he could probably do was open his eyes and smile. And that’s only when he saw a video that made him smile. Day 78. Day 101, he’s laughing he’s communicating. He can tell you yes and no by looking up and down. he can kick his legs when you tell him too. He can kick the ball. He can wave hello and goodbye. He can do multiplication. Addition subtraction. I mean, he’s all there,” said April. Continuing to gain strength, Hunter transitioned to specialized technology including the Lokomat to regain his gait pattern. "It’s a great place … This is top-notch. I’m so happy, so happy we brought him here. It’s just unbelievable. Unbelievable,” said Bob. Learn more about Madonna's specialized pediatric rehabilitation program.